In mid-winter, the bees in my hive are hopefully buzzing away in a tight cluster, keeping each other warm. It’s best not to take the lid off when it’s cold out, so I don’t actually know what’s going on in that box. While I could get lost in a thought experiment of the Schrodinger’s cat variety, instead I don’t think too much about it and order bees to be delivered in April, just in case. Last year’s winter was long and very cold. 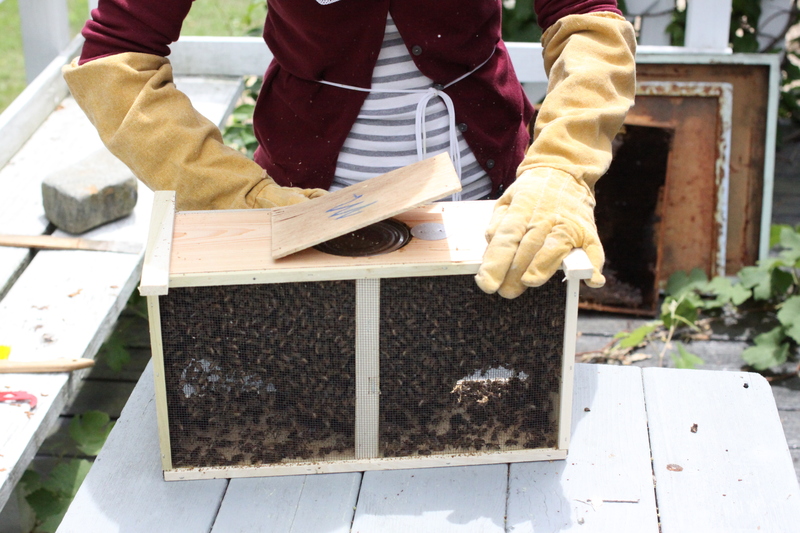 My bees did not make it through, so the colony that is currently in the hive is the one I installed this past summer. Their shipment was delayed due to weather issues down South and they didn’t arrive until June, giving the bees a late start in building up their stores. 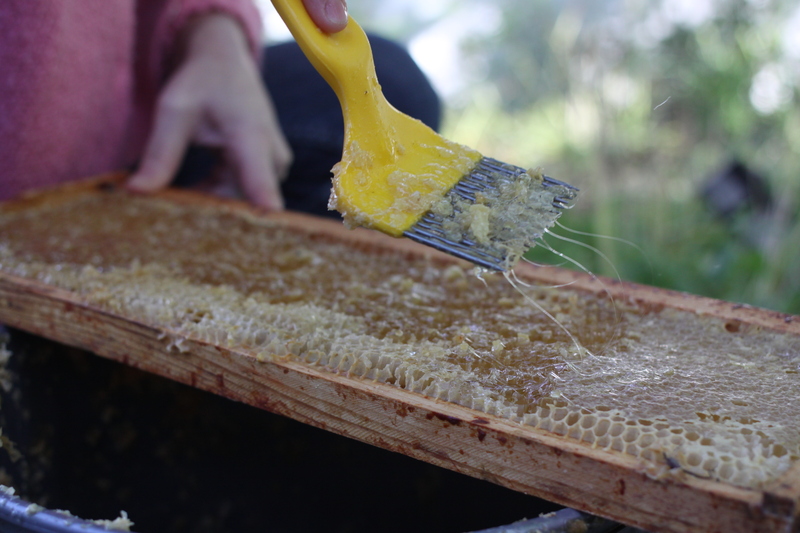 When keeping bees, the single most humane thing we can do is to limit the amount of honey we steal. Bees work hard to make every drop, and they do so for reasons that have nothing to do with humans having a sweet tooth. They eat their supply of honey all winter long, using the energy to keep their bodies moving. With no central heating, movement is the only way to keep the temperature up. Many people steal honey from bees in the fall, making their best guess as to how much the bees will need over the winter and how much it’s safe to take. I prefer to wait until early summer to see what’s left, and even then, I leave them a good supply. So I’ve not taken any honey from these bees, and won’t decide for a few months whether I should. The inner workings of a bee colony are incredibly complex and not completely understood. When striking a balance between our wants and the colony’s needs, I’d rather err in their favor, even if it means a little less gold in the pantry. 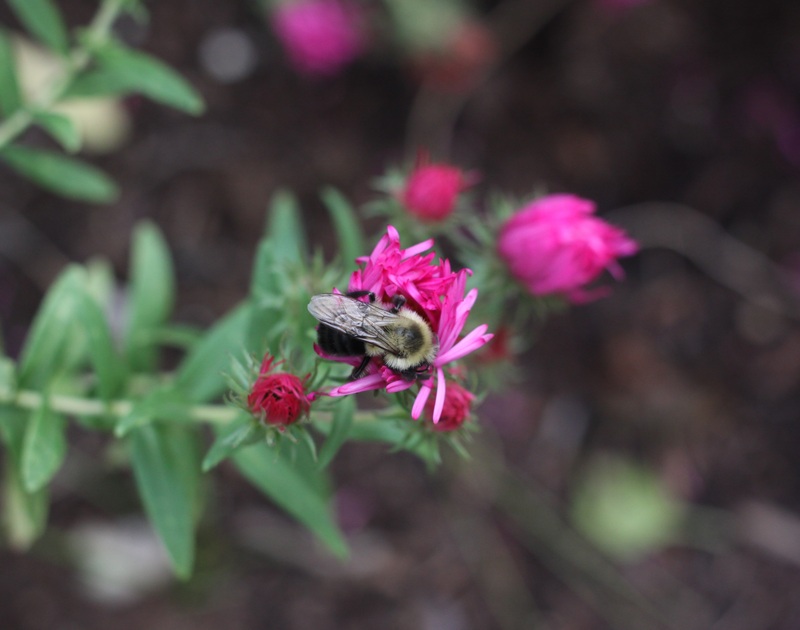 The bees are soaking up every last drop of color and sweetness and sunshine. You can bet we humans are too. 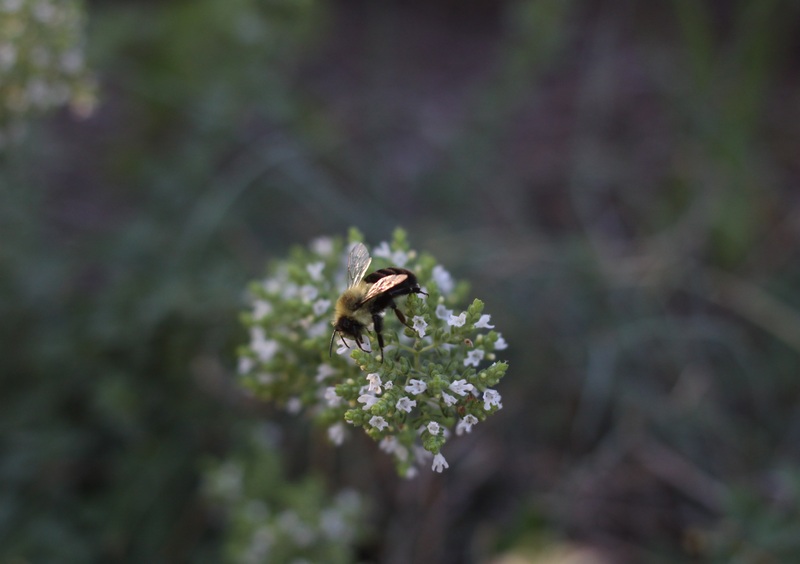 The oregano is beginning to flower, keeping the bees busy as they stock up on food to get through winter, just as I do. Oregano is intent on taking over the world. No matter how often I cut it back, it inches ever outward, claiming any bit of dirt it can reach. We grow Greek oregano and spicy oregano, which I dry and mix together. They’re only slightly different in flavor, but combining them adds a bit of depth. With temperatures in the nineties today it’s hard to imagine wanting a hot lasagna sprinkled with dried herbs, but I know that day is coming sooner than I – or the bees, I imagine – would like. Hopefully we’ll all eat well when the snow flies. 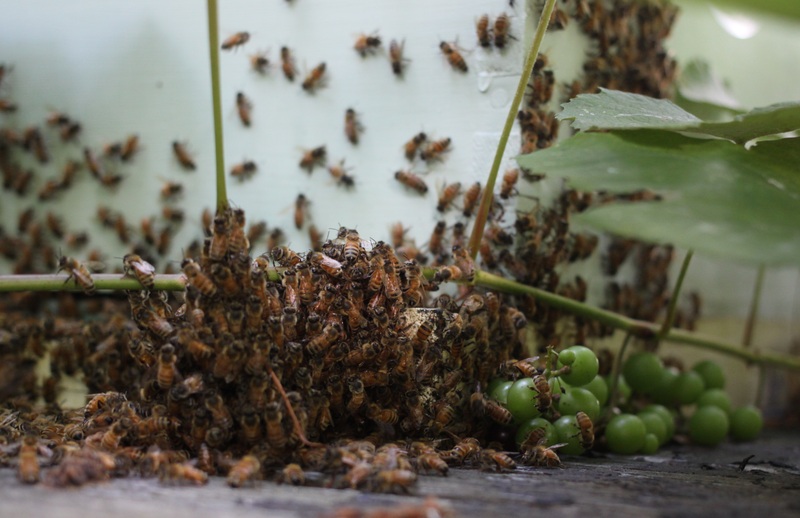 Too many bees in a hive on a hot and humid summer day would mean a lot of energy wasted in fanning to try to keep things cool. Instead, bees ‘beard’, sitting outside the entrance in large clumps. This year our grapevine grew in front of and above their entrance, and the bees seem to be enjoying the shade its giant leaves provide. You might think we would learn from their behavior, but no. We spent this hot weekend in the kitchen, standing over boiling pots and even turning on the oven for some baking, a single fan moving the heat around but not providing much relief. I know when I pop a jar of preserves in the winter my memory of that heat will be tinged with longing for these long summer days, so I’m doing my best to enjoy every sticky moment.